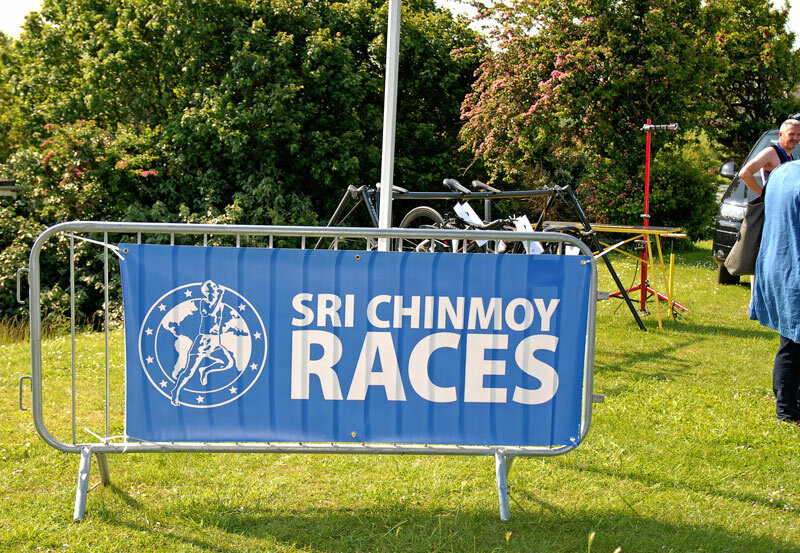 Recently, the UK Sri Chinmoy Marathon Team organised the fourth Sri Chinmoy ‘Tri a Triathlon‘. 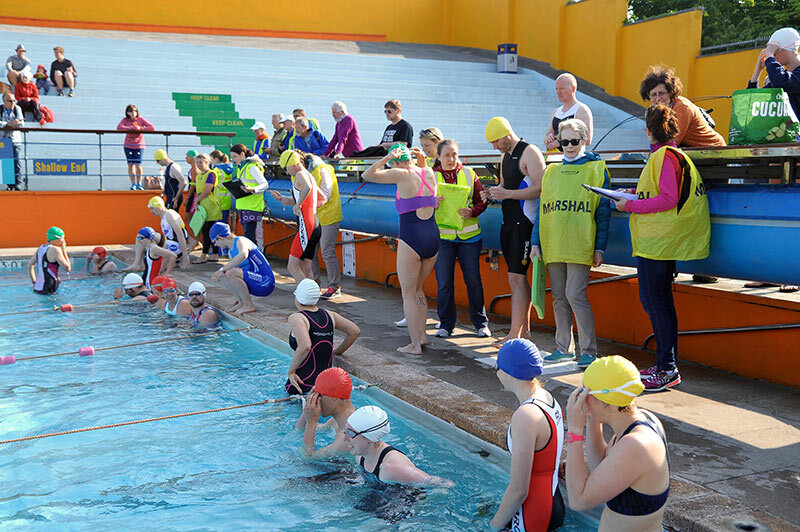 It is billed as ‘the perfect beginner’s triathlon’ and is very popular with people, wishing to give the triathlon a go – often for the first time. 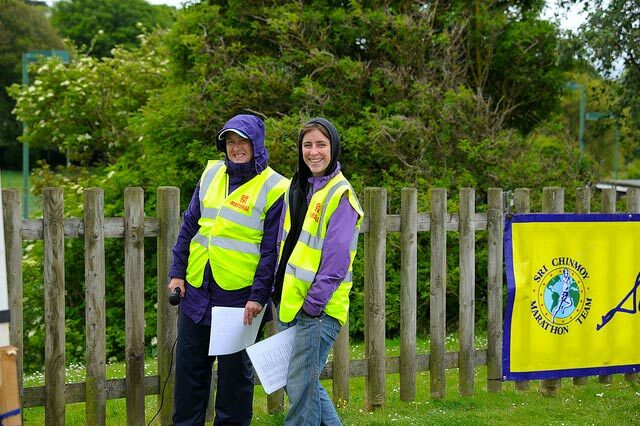 The multi-disciplined event requires a team of over 40 volunteers, responsible for helping to marshal and time the swim, cycle and run sections. The main organisers are Garga and Kokila Chamberlain, who became inspired to organise a triathlon from a brief comment, Sri Chinmoy made several years ago. Organisers, Kokila and Garga giving a pre-swim briefing. In around 2003, Sri Chinmoy was at a function in Paris. In passing, he mentioned he would be very happy if the British centres held a triathlon. To many at the event, this brief comment was soon forgotten, lost in the intensity of spending a few hours with Sri Chinmoy. That weekend, Sri Chinmoy spoke about many things, and there was a vortex of spiritual activities and energy so it was easy to forget a short comment such as that. However, the talk of a triathlon stirred something in the mind of Garga and he became determined to see the vision of a British triathlon manifest in reality. A few years later, a joy day with students of Sri Chinmoy morphed into a trial triathlon where the only competitors were members of the Sri Chinmoy Centre. We had a 100m swim in a local pool, before a leisurely breakfast and then a move to quiet Cambridge road to have a bit of a cycle. After this brief foray into the world of cycling we retired for a typically English summer lunch of Cucumber sandwiches and generous portions of cake. Those not too weighed down by mid-day lunch completed the very relaxed approach to a triathlon with a 2 mile run around Parker’s Piece. The Ironman, this triathlon was not, though technically we did manage swim, cycle run. It was a bit of fun, but there wasn’t so much enthusiasm to organise a proper triathlon. It seemed quite a step into the unknown and there were the practical difficulties of organising a large-scale multi-disciplined event in the cool climate of the UK. 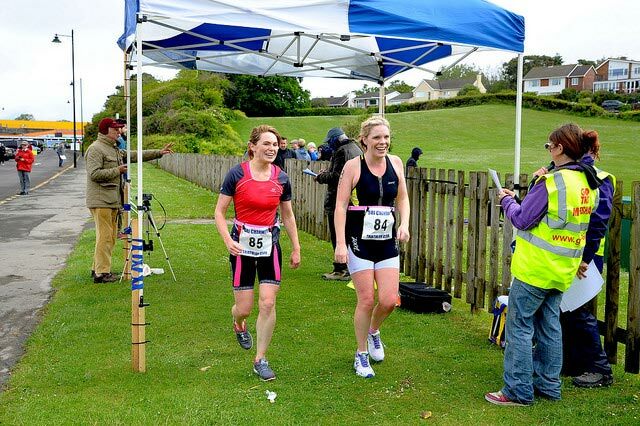 However, Garga’s persistence saw the birth of a triathlon in the village of Portishead a few miles from Bristol. There is a saying ‘where there is a will there is a way’ and this is particularly true for the spiritual life, with enthusiasm and willingness practical difficulties can be overcome. 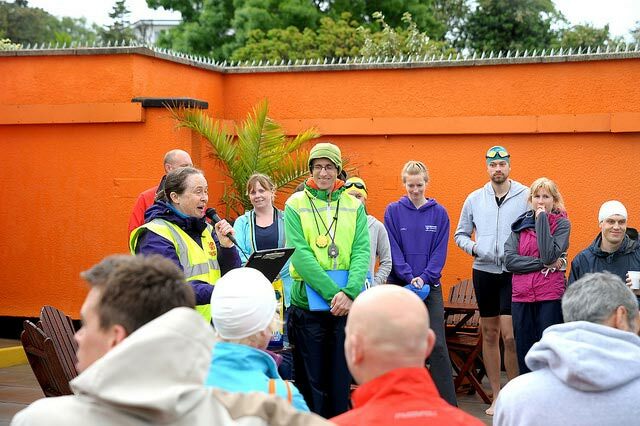 The first triathlon was not all plain sailing – cold, wet and windy. But, it exceeded expectations and with the first one done, everyone gained confidence. 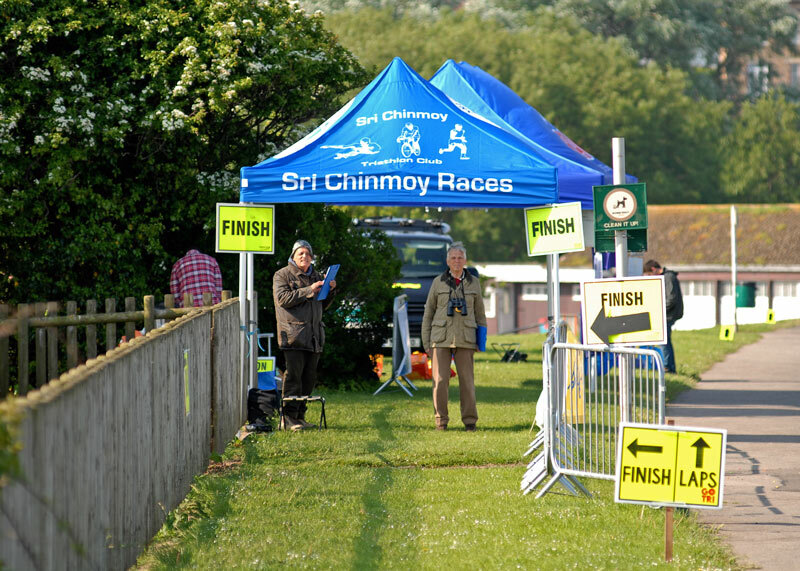 The Sri Chinmoy Tri a Triathlon has emerged as a popular event for both competitors and organisers. Competitors have been generous in praise of the cheerful encouragement from all the volunteers who take part in the event. A few years after organising the first triathlon, Garga had a near-fatal heart attack, yet he took this not as a reason to retire and take it easy, but as an unexpected ‘rebirth’ and he continues to organise and promote triathlons with undimmed enthusiasm. You wouldn’t notice from his calm demeanour during the hectic weekend of the event that he was once at death’s door. In fact, he has set up other duathlon events, which help to get people interested in the multi-discipline sport. The Tri a Triathlon has given quite a few competitors the chance to gain the joy and satisfaction from their first steps at self-transcendence in the triathlon world. “I organise the Try-a-Tri for two reasons. Firstly it was Sri Chinmoy’s asking the question that made me think, why not? We could do that! Secondly I get so much enjoyment from racing myself, especially multi sport events, that I wanted to share that joy with other people. There’s a special energy that you feel at beginners events, when everyone is taking a step into a new adventure , and that’s what makes the Try-a-Tri so unique. It’s not always as sunny as this. But in 2016, the weather was very kind. Sri Chinmoy spoke on the importance of triathlons and why he encouraged his students to organise them. – Sri Chinmoy, The outer running and the inner running.